Ahok: Last man standing and Indonesia’s best hope for change? Living in Indonesia these days feels as if someone has pulled the plug, and all the common sense and integrity that we expect even of our most revered political hopes are draining quickly out of the country. The Outsider Jokowi, whom many of us had hoped would be a catalyst for change against a corrupted and ossified elite, now seems a shadow of his former self after his indecisiveness over the KPK-Police issue. Some people are hoping against hope that his dithering was actually some master chess move to get rid of Budi Gunawan who is widely to have been foisted on him by PDIP matriarch Megawati. This seems a long shot, however, and suggests that the hopes had watched too much Black Adder and the antics of the scheming Baldrick in their formative years. Recently we have also seen the disintegration of Transport Minister Ignasius Jonan. Once lauded for his fantastic performance to get the country’s rail transport to run on time – no mean feat considering how bad it was – Jonan his been on crash and burn mode since the Air Asia disaster. he berated Air Asia for the failings of the aviation authorities, then he banned several routes for no good reason, then shot his mouth off on civil aviation investigations into the crash. He also issued a bizarre ruling that airlines would not be able to sell tickets at airports. And when it came to Lion Air the Minister who is known to roar at his subordinates his disapproval, squeaked like a mouse and got the state-owned Angkasapura to bail out the private airline as it did not have enough funds to compensate passengers stranded for hours because of its delayed flights. And Surabaya Mayor Risma, once considered part of a new wave of local leaders able to effect change in Indonesia, has recently gone off the rails with her crackdown on young lovers and the sale of condoms on Valentine’s day. Why she is encouraging backroom abortions and the spread of HIV with this morally-infused crackdown is anyone’s guess. The KPK, once the hope of Indonesians to clean up corruption is now a shadow of its former self as the new head hints at going soft on the real issues. Sure, it has been weakened by its fight with the police over Budi Gunawan and the police and the judiciary are responsible for wounding it, but let’s not forget that some of the KPK’s wounds are also self-inflicted. Begining with Antasari some of the KPK’s leaders like Abraham Samad fail to recognise that in this high profile job whee you are up against a lot of bad guys, they must be more virtuous than Caesar’s Wife if they are to maintain the integrity and authority of that office. Alas they had feet of clay and exposed the Achilles Heel for its opponents to take pot shots at. Which bring us to Ahok, the Governor of Jakarta. He is now being threatened with ouster from his post by the City Councillors. They want him out because he’s refuse to confirm to their version of the City budget that, as we are learning more every day, contains irregularities that suggest corruption. Ahok seems vulnerable because he does not even have a party to back him up, the’s a Chinese in the traditionally non-Chinese dominated arena of politics and he’s a Christian in Islamic majority Indonesia. None of this seems to have fazed him, however, as he continues not only to defy the Councillors but to do so in a confrontational manner. Granted, Ahok can be abrasive and he may not be everyone’s cup of tea, but his bravery and Devil-may-care attitude may be the thing that Indonesia needs now. Unspun would argue that Ahok, more than Jokowi or any other politician deserves the support of the public. If there are enough of us who are willing to take to the streets to frighten the hell out of the councillors then they will back down and a strong message will be sent to all politicians that the People, not them, are in charge. if Ahok, with the support of the people, can prevail over the corrupt city councillors and their parties, there stands Indonesia’s best chance of knocking down the other bowling pins of corruption and elitist politics. A victory for Ahok could prove a decisive and fatal blow to the old forces. There have been some demonstrations in support of Ahok, notably yesterday’s gathering at Bundaren HI during car free day. There is also a petition being signed by tens of thousands at change.org. But that is not enough. Shame is not a language that the politicians and councillors understand. Neither is logic. The only language they understand is force. Force can be manifested either peacefully or violently. There is no need to resort to violence in Indonesia under the present circumstances. So what should be done? Occupying the City Council to deny the councillors access or, better still, if they are inside, denying them exit would be tremendously effective. Half jokingly a friend yesterday suggested that the artistes and others who were so effective at the Salam Dua Jari Concert should organize another event calling it #BringtheHouseDown. Nothing short of something like this would force the councillors to back down. The problem, however, is whether Indonesians, especially Jakartans, have been gentrified by social media to the point of ineffectiveness. Do they possess the same spirit as the protesters in 1997-98 who brought about the Reformasi, or are they faux democracy supporters armed with social media accounts. A bit like harley Davidson riders pretending to be road warriors? It is too easy these days to “do something” for a cause by liking it on FB, Tweeting a #, or signing up for a cause in change.org that results in — nothing but a lot of noise ricocheting about in cyberspace with no tangible real effects. So what is it going to be? Waking on the Internet or taking to the streets? In a court of law Democrat Party Chief Anas Urbaningrum’s argument that he should be presumed innocent until found guilty of corruption allegations makes sense. As he says he’s not even been indicted and as such there is no need for him to step down from helping the Democrats. Then there is the court of public opinion in which Anas has been virtually tried, judged and convicted as guilty as sin when it comes to corruption. That this is so is seen in the fast deteriorating confidence that Indonesian voters have in the Democrat Party, as attested to by several political polls. It now looks that unless the Democrats have a house keeping they will continue to lose support just in time to be trounced in the 2014 general elections. Sooner rather than later Anas will, because of his conviction in the Court of Public Opinion, become such an embarrassment that he would be forced to step down. What’s funny here is that Anas and his supporters have only themselves to blame as they virtually pleaded no contest to all the charges leveled at them in the Court of Public Opinion. There was no attempt at all to plead his case before the public, to convince the public that he was unfairly accused and that he is innocent. All this is indicative of the elite politics mindset that Indonesia’s politicians embrace. Theirs is a world where what matters are the intrigues of palace politics, political patronage and the backdrop deals. These practices have no place in a democracy where, sooner or later, public opinion will assert itself. So. What are the Democrats going to do? Make lame noises about how Ana’s should go and then wring their hands in hopelessness and do nothing? Or take decisive steps and, if nothing else, suspend Ana’s from all positions and power until it all blows over. The former course is to court certain defeat at the upcoming polls. The latter at least gives them a chance to repair the damage before the polling starts. Makassar – Ketua Umum DPP Partai Demokrat Anas Urbaningrum menanggapi sambil lalu desakan mundur dari internal Partai Demokrat seperti yang diserukan Ruhut Sitompul. Anas menegaskan dia tidak berstatus terdakwa atau tersangka. “Anda semua tahu, ini obyektif sekali, saya bukan terdakwa, bukan tersangka, saksi saja tidak, statusnya jelas seperti itu,” ujar Anas saat ditanya detikcom soal desakan mundur dari internal partainya, usai melantik Pengurus DPC Demokrat Kabupaten Gowa, di Gedung Haji Bate, Sungguminasa, Sulsel, Rabu (8/2/2012). Anas menambahkan, partainya memiliki mekanisme yang dijalankan berdasarkan AD/ART, etika dan peraturan organisasi. Terkait permintaan mundur, Anas menyerahkan semuanya pada mekanisme partainya. “Menyangkut proses hukum, pendirian kami jelas, kami menghormati proses hukum, kami menyerahkan sepenuhnya pada aparat hukum untuk memproses secara adil dan obyektif, berdasarkan prinsip-prinsip penegakan hukum yang adil, bukan berdasarkan desakan-desakan atau tekanan opini,” pungkas Anas. Sebelumnya, Ruhut Sitompul meminta Ketua Umum PD Anas Urbaningrum mundur demi masa depan PD yang lebih baik. Apalagi jika dikaitkan dengan pemilu 2014 mendatang. Kasus-kasus yang berkaitan pengurus PD, dimungkinkan membuat citra dan perolehan suara partai jeblok. What Unspun loves about living in Indonesia is that every once in a while, amid all the muck, detritus of corruption, indecision and self interest there will emerge something wonderful, like a water lily flower blooming resplendent even though it emerged from the mud. Last night was such an occasion. 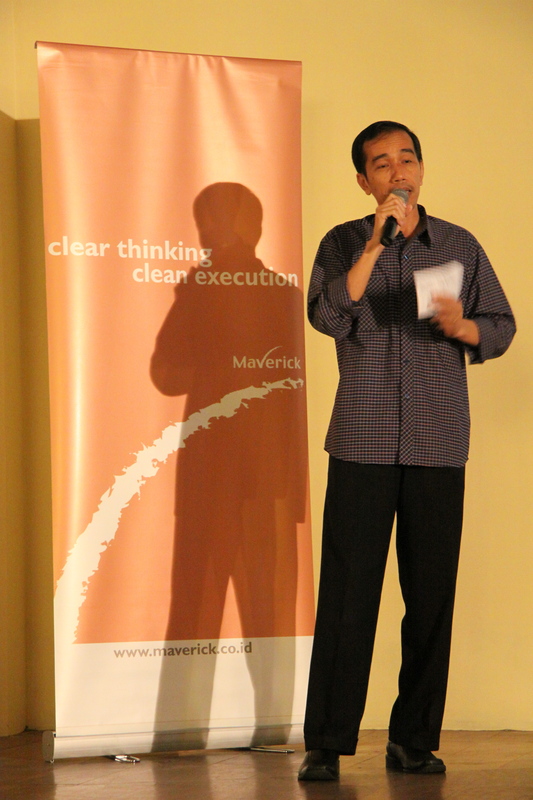 It was Pecha Kucha Night, the seventh that Maverick has organized, and it had a star studded list of speakers that included film director and Indonesia’s most influential Twitterer Joko Anwar, iconoclast Pragiwaksono, “Bapak Blogger” Enda Nasution. And there was also Joko Widodo, more commonly known as Joko Wi, the legendary mayor of Solo. Joko Wi has become a legend in Indonesia because he has shown what one man with integrity and political will can do for a city and, by extension, the country. Last night he shared with the audience of about 250 people who gathered at Es Teler 77 Resto on Aditywarman what he’s been able to achieve in Solo. In a country where city administrations flail hopelessly in indecision and moribund projects, Joko Wi, since taking office in 2005 has virtually transformed Solo. He has, among other things, built 13 traditional markets, rehabilitated 17 km of the banks of the Bengawan Solo with plants and recreation areas and made it easy and quick for residents there to get their KTP (identity cards). His dedication to greening Solo has even earned him the affectionate nickname of Wagiman an acronym for walikota gila taman. He also shared with the audience the different events they have created to encourage the arts in Solo such as ethnic music, batik and other cultural festivals. His presentation, that he gamely delivered in the Pecha Kucha 20:20 format (20 slides, 20 seconds each) was so inspiring that he received a standing ovation when he finished. There were also calls from the audience for him to take over the Jakarta administration. A wit in the crowd shouted that he should never grow a moustache, a reference to Fauzi Bowo the hapless and incompetent mayor of Jakarta. During the break in the middle of the Pecha Kucha event many people from the audience came up to Joko Wi to congratulate him and to tell him how inspirational his talk had been. Unspun thought that this was such a good way to be remembered – for what you have achieved and done for the people – rather than how other Indonesian politicians like to be adored for – through their Hummers, fancy cars, large chunky jewellery or their “cleverness”. After a break in the middle of the Pecha Kucha event, Unspun and wife had the opportunity to accompany Joko Wi for dinner. Joining us was Linda Hoemar Abidin from kelola for the Arts, another speaker at last night’s event. During dinner we spoke of many things such as how he ended up being mayor (in his self-effacing way he said that he merely registered hi name at te urging of some friends and was surprised when he was elected, probably because the residents there wanted a change and a new face). We also asked him what was his secret for success. How did he manage to go such great things for Solo when other mayors had failed. He said it all boiled down to intention (niat in Indoneisan). That and working with communiies who had great ideas and creativity – the city government merely had to empower them and provide the facilities or infrastructure and let them do the rest because public servants did not have the best mind sets to be creative. One member of our group said that it was ironic that DPR members feel that they have to go to Italy and other countries to learn about administration and development when all they had to do was make a trip to solo. Joko Wi just smiled. Susno: comeback king or a wounded bull in a china shop? I’ve said my piece in the Jakarta Globe article below. What do you think? Susno Duadji says he has taken steps to ensure his safety after making corruption allegations against fellow officers in the National Police. “I’m not a little boy anymore. I calculated the risks before I opened my mouth. I’m not afraid. I know the National Police institution and I have taken preventive measures,” the former National Police chief detective told detik.com. He said he anticipated the possibility of being slandered, attacked, imprisoned and even murdered. “I don’t stay in one place anymore now. It’s not safe for me anymore,” he said. Susno has even enlisted an NGO to sample his food lest he be poisoned. “We’re guarding his health because he’s under a lot of pressures,” said Dr Joserizal Jurnalis of the Medical Emergency Rescue Committee or MER-C.
Susno appears to have made a remarkable comeback in the public sphere. Reviled late last year as king of the corrupt “crocodiles” in a battle against the “geckoes” of Indonesia’s Corruption Eradication Commission (KPK), he now presents himself as a man risking his life to battle graft. He has even been mentioned as a candidate to lead the KPK. But talk of Susno heading the antigraft agency comes from politicians “with an axe to grind,” says media strategist Ong Hock Chuan of Jakarta’s Maverick public relations firm. “The press picks up those interpretations and presents them as fact,” said Ong, who dismissed the notion that Susno could actually get the position. Meanwhile, Ong suspects Susno’s actions are not a strategy to reinvent himself but simply an attempt at revenge. The longtime police officer was removed from his position in the wake of the KPK scandal. “I think he’s like a bull in a china shop, a wounded bull. It’s about getting back at the people who cost him his career,” he said. It is, of course, complete nonsense that disgraced-police-top-brass-turned -whistle-blower Susno Duadji should even be considered as a candidate to lead the Corruption Eradication Commission. The preposterous suggestion comes from Golkar, a party with a huge axe to grind, especially after they failed to oust Boediono and Sri Mulyani in the recent furore over the Bank Century case, and therefore should be ignored. Despicable slimeball as he is, however, Susno deserves all our support and encouragement for the time being. This is because he is the guy who knows where all the skeletons are buried in the Police Force. And now that he’s been done out of a career in the Police Force, sacrificed, as it were by fellow slimeballs and corrupt officers, he’s now out for revenge by spilling the beans on his former comrades. This is unsavory but healthy for the nation for it will help bleed corruption out of the system faster than other means. It is interesting to see how the implicated police officers are now screaming blue murder and getting all defensive about their role in the alleged corruption cases. All of them have predictably protested innocence but how innocent are they? If the country’s journalists are worth their salt they would go digging around the houses and families of these police officers. How many of their wives would sport Bulgari watches, Louis Vuitton or Hermes handbags? What luxury cars do they and their family members drive? How many Blackberries per household? These are telltale signs of the integrity of lowly paid police officers and it is extremely simple to find out. So Unspun is at a loss why the journalists haven’t gotten of their backsides to do some investigation. In the meantime and in the absence of some investigative spirit among the journalists the only recourse we have left is to egg and encourage Susno on in his mad quest for revenge. Feed his delusion that he could be the head of KPK, or even the police department, stoke his ego or whatever it takes to keep him spilling the beans on the corruption in the police department. So anyone up for a “Susno for President” campaign? Former National Police detective chief Susno Duadji has been tipped as a candidate to lead the Corruption Eradication Commission (KPK). “Susno has a chance,” legislator Bambang Soesatyo from the Golkar Party said as quoted by kompas.com. The KPK has no chairman after the House of Representatives rejected the government regulation-in-lieu-of-law that appointed Tumpak Hatorangan Panggabean as KPK acting chairman, replacing Antasari Azhar who was found guilty of murder. Four KPK deputy chairmen, however, remain on active duty. Bambang said the government must decide quickly whether the KPK should have a new chairman or whether the current deputy chairmen were sufficient. Two stories in the front pages of most Indonesian newspapers today tell a very interesting story about Indonesia and corruption. The first is a report by the Hong Kong-based Political & Economic Risk Consultancy and tells us how corrupt Indonesia is, at least in terms of perception. The verdict: Indonesia is perceived as the most corrupt nation in Asia Pacific, beating out countries like Cambodia, Vietnam and the Philippines. This is no mean feat and you have to wonder why the perception is so bad because things work better in Indonesia than in some of these countries. Once again, Indonesian has made it onto a list of superlatives. Unfortunately, not for something the nation should be proud of. The Hong Kong-based Political & Economic Risk Consultancy put Indonesia at the bottom of its latest Asia-Pacific corruption perception ranking, issued on Monday. While Singapore topped the list of countries perceived to be clean of corruption, with a score of 1.42, Indonesia fared worst out of the 16 countries surveyed with 9.27. Cambodia was second from bottom with 9.10, Vietnam and the Philippines scored 8.07 and 8.06, respectively while Malaysia was ninth, just ahead of China, with a score of 6.47. The PERC study was based on perceptions, not reality, but perceptions do matter. The absolute level of corruption in Indonesia, it said, might not be any worse than in any other Asian country, but the perception that corruption is especially bad here will make it more difficult for the country to attract foreign direct investment and toughen the terms of those investments. Then there is the second story that perhaps tell us why the perception is so bad. It is a story about how, after six years of dicking around, the lawmakers involved in a bribery case linked to the appointment of a central bank senior deputy governor is finally going on trial. Why the delay? Six years of justice delayed is justice denied. The bribes were apparently paid out in travelers checks, which would have left a paper trail wider than Gelora Bung Karno. But the most interesting aspect of this story, and perhaps the fact that explains why Indonesia is perceived to be most corrupt in the region, is that the person at the middle of it all, the senior deputy governor Miranda Gultom, has astonishingly been unimplicated in this entire mess. We have lawmakers who have admitted that they were paid to vote her in as Bank Indonesia Deputy Governor. As evidence is the travelers checks. You do not need to be Sherlock Holmes to connect the dots and establish a legal case, but the lady remains above the fray, like an immortal looking down on the shenanigans of lesser mortals. Is the perception of how bad Indonesia’s corruption is based on the inference that ony the smaller fish get fried while the bigger ones enjoy full run of the ocean? When will Indonesia begin to change this perception? Sitting lawmaker Dudhie Makmun Murod went on trial at the Anti-Corruption Court in Jakarta on Monday for his alleged role in a Rp 24 billion ($2.6 million) bribery case linked to the appointment of a central bank senior deputy governor in 2004. The House of Representatives member from the opposition Indonesian Democratic Party of Struggle (PDI-P) is accused of distributing Rp 9.8 billion to 18 fellow party members serving on House Commission IX, which at that time oversaw financial and banking affairs, in return for voting economist Miranda Goeltom into the Bank Indonesia post. Miranda was also backed by dozens of lawmakers from three other party factions — who were also alleged to have taken bribes — and enjoyed a landslide victory with 41 votes from the 51-member House commission. Former lawmakers Hamka Yandhu of the Golkar Party and Udju Djuhaeri from the Police and Military faction, as well as sitting United Development Party (PPP) lawmaker Endin Soefihara, are now awaiting trial for allegedly distributing the bribe money to their respective faction members. Zero Rupiah note for the oknum in Indonesia? Came across an interesting story in The Economist about how an NGO called 5th Pillar is distributing Zero Rupee cupons in India as part of the fight against corruption and bribery. It is of no commercial value but comes in valuable when officials ask you for a bribe. That’s when you pay them the Zero Rupee note. Crooked officials apaprently have been so ashamed or stunned by being given these notes that they repent their ways. Unspun wonders if a Zero Rupiah note would work in Indonesia?